I have a situation where I could use a little assistance or your recommendation. In training dogs, what situations would you advise using a clicker, and which ones would you prefer another method? I am trying to figure out which is best for what types of training. 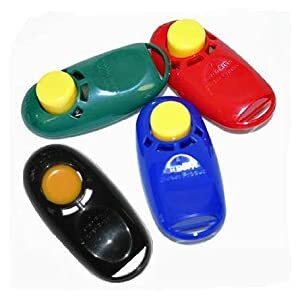 I do know that some dogs are afraid of it, but aside from that, I'd just like an opinion on the best areas of training for using a clicker. 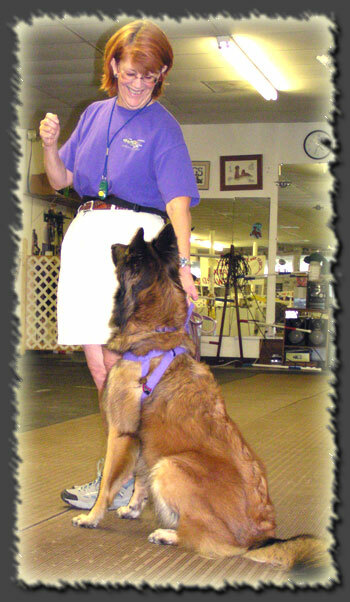 The clicker is a fabulous tool for positive reward training. But, I don't use it in all situations. There are some trainers who just use clickers occasionally, and some who use it as the basis for all their training. The effectiveness of the clicker is based on the concept that it is a marker/bridge to let the dog know that THAT particular behavior is the one which will earn it a reward. As a marker it has the advantage of being unique and something that stands out in the dog's mind. It also has the advantage of sounding the same no matter who is using it or what emotions the handler is feeling. So when there are multiple trainers/handlers in a household, the clicker helps give a consistent message. It also has no emotion attached to it - it is pure and concise. So if you've had a rotten drive home on I-4, the clicker doesn't impart that anxiousness to your pup. I personally find the clicker most useful when I'm trying to shape a behavior. This means that I have to get small approximations of the behavior and build it up to the finished product. I don't use it as often for simpler behaviors where I can lure the dog into the finished behavior without having to go through steps. For example I might use a simple lure/hand signal to get the dog into a 'down' position. You can click that, of course, but you don't have to. Dog follows the treat into a prone position and gets the treat in that position. She "gets it" that being is that position is what earned her the food. If I'm trying to get the dog to go to her bed and lie in it, I will use the clicker to mark small approximations of the end behavior I'm building. I will begin clicking any interaction with the bed, might toss one or two treats into the bed and click when she's in there, then toss the actual reward treat outside the bed to restart the 'game'. A clicker savvy dog figures out quickly that it's the bed that gets the treat. Then you up the criteria and only click for say, putting a paw on the bed, then for two paws, then getting in, and so on. It sounds long to write up, but it is really a very quick process and it is amazing to watch the dog learn. They love the 'game' because they are using their brain and having fun while they learn. So the quick response is that if the end behavior can be lured or molded such as with a spin or a sit, I feel the clicker is superfluous. I also have to take into account the ability of the trainer to time the click and coordinate all the parts. But if the end behavior requires chaining several behaviors together, or capturing a behavior like a stretch to turn into a "bow" then the clicker is the perfect tool. Give it a try! A good source for more info is www.clickertraining.com and kikopup's channel on YouTube. Finally, watch for our post coming up this Saturday, December 18, when we will offer an extremely entertaining Kikopup video right here. You're sure to enjoy this wonderful dancing troupe. Don't miss it! I have a hard time being precise with the clicker. In order to use the clicker effectively, I need to train myself to use it first. But since I prefer to use the verbal cues and since I sometimes tend to get a gushy with my praise, I have procrastinated on learning to use the clicker. Old habits are hard to break and my dogs do just fine without it. Awesome explanation of clicker training! Such a simple methodology that I so often see explained in a cumbersome and often unrealistic way. You nailed it! !